The Neuropatholator Wall Chart was a great tool for ‘clearing the way’ but today more tools are necessary. 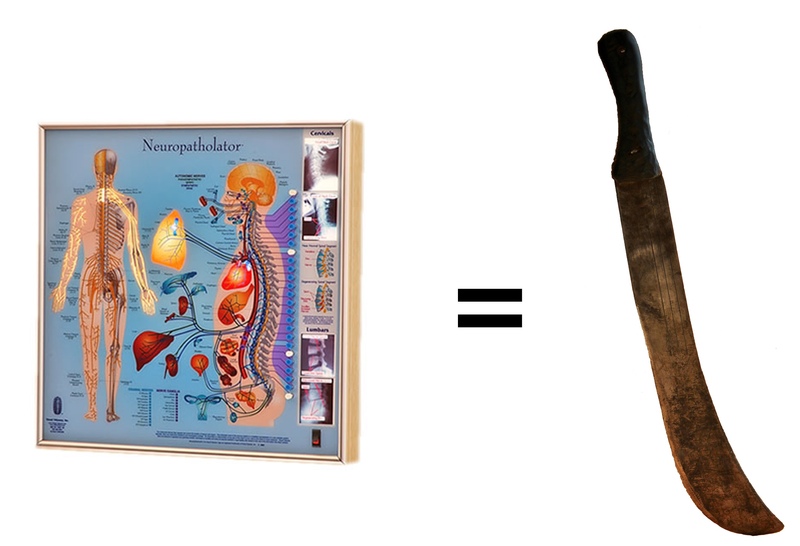 For 4 decades the Neuropatholator Wall Chart has been the Machete that has blazed trails through the jungles of building a robust practice. It slashes through the old tangled paradigms of patient beliefs that symptom relief is all there is. The myth that Chiropractic is only good for back and neck pain. It did it as swiftly as swinging a machete or to be more precise in the time it takes to push a button and clear away the brambles of bad beliefs as the offending vertebra and associated nerve pathways to muscles and extremities were simultaneously demonstrated with the organs relying on that same spinal level. Trails became roads as patients ‘Got the Big Idea’ and followed through and even brought others in for care. Making a swift gash through the weeds is no longer enough. Neuropatholator Touch Software has up to 800 ‘blades’ so you always have the right tool at your fingertips. Today requires finesse along with solving many problems. The Neuropatholator Touch Software is the Swiss Army Knife for all those jobs a machete just won’t do. Maybe it’s discussing spinal integrity, phases of care, phases of degeneration, postural impact on health, development of the nerve system and the spine, do’s and don’ts, exercises, disc problems and decompression, symptoms vs. cause, workplace ergonomics, backpack safety, whiplash and auto injuries, athletic performance enhancement, and much more. Let’s face it, once you get to the camp site there are other jobs to do. If you want to turn a phillips head screw, magnify something, pull a splinter, get something out from between your teeth, put a hole in leather, cut a picture out of a newspaper, file a sharp burr of metal, or even open a bottle of wine – a machete just won’t ‘cut it’. That’s precisely why I created the Neuropatholator Touch software in 2000. Refined and improved for 16 years, it not only provides the rapid clearing of a machete, but also all the other critical functions you need to cut through the choking thick misconceptions new patients bring to your office and answer all the other questions that turn your new patient into an informed ambassador of you, your practice, and the chiropractic lifestyle. Completely affordable, compact and ready for your every educational opportunity and need. Let the Neuropatholator be your “go to” tool for patient understanding and practice growth.